A Russian Soyuz spacecraft glided to a picture-perfect automated docking with the International Space Station early Wednesday, closing out a two-day rendezvous and briefly boosting the lab's crew back to six with the first post-shuttle crew rotation flight. With commander Anton Shkaplerov monitoring the computer-guided approach from the spacecraft's center seat, assisted by flight engineer Anatoly Ivanishin on his left and NASA astronaut Daniel Burbank on his right, the Soyuz TMA-22 docked with the station's upper Poisk module at 12:24 a.m. EST (GMT-5), two days after launch from the Baikonur Cosmodrome in Kazakhstan. 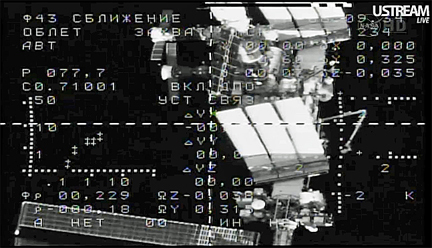 "Docking confirmed," NASA commentator Rob Navias said as the Soyuz engaged the Poisk docking mechanism. "A six-man crew re-established at the complex." After hooks and latches engaged to firmly lock the Soyuz in place, and after leak checks to verify a tight seal, hatches were to be opened with Expedition 29/30 commander Michael Fossum, cosmonaut Sergei Volkov and Japanese astronaut Satoshi Furukawa standing by to welcome the TMA-22 crew aboard. Arriving station crews normally enjoy an extended handover period to give newly arrived astronauts and cosmonauts a chance to learn the intricacies of lab operations. But this time around, because the Soyuz TMA-22 launch was delayed in the wake of an August launch failure, Shkaplerov, Burbank and Ivanishin will have less than a week of handover time before Fossum and his crewmates return to Earth Nov. 21 U.S. time. "I think the hardest thing for us will be to quickly adapt and take the most advantage we can of the short couple of days we'll have on board with Sergei and with Mike and Satoshi," Burbank said before launch. "But I think we made good progress before this, spending a lot of time talking with them, in some cases almost on a daily basis, and we've done a lot of the handover work with them ahead of time. "I still anticipate it'll be a challenge for us, but we've got a big team on the ground ... and I think everything will be successful." The Soyuz TMA-22 spacecraft blasted off from the Baikonur Cosmodrome late Sunday U.S. time, nearly two months behind schedule because of a third-stage failure that destroyed an unmanned Progress supply ship Aug. 24. Because the third stage was virtually identical to the one used by the manned Soyuz, Burbank and company, originally scheduled for launch Sept. 22, were delayed pending a failure investigation. Engineers ultimately blamed the Progress failure on contamination in a third stage propellant feed line and after extensive analysis and inspections of already-built engines, the Soyuz TMA-22 vehicle was cleared for flight. There were no technical problems of any significance. "I'd like to congratulate our Russian colleagues on a tremendous launch and docking," said Bill Gerstenmaier, chief of space operations at NASA headquarters. "The Russian team did a tremendous job getting the crew prepared and making this launch and docking occur." If all goes well, three more crew members -- cosmonaut Oleg Kononenko, European Space Agency astronaut Andre Kuipers and NASA astronaut Donald Pettit -- will take off aboard the Soyuz TMA-03M spacecraft on Dec. 21, docking two days later.